For a long time, I’ve had the idea of finding a place to live that has a fireplace or a wood stove, because building, tending, and gazing at fires adds up to a soothing experience for me. However, I usually and conveniently forget the fact that I did once live in a place with a fireplace. I think I used it three times over the several years I was there. The whole place smelled slightly of damp soot permanently after the first time. When I do remember that, and realise the same thing would likely happen, I then change tack and think a wood stove would be nice, so long as it had a large glass door in the front and I could see what’s going on. Problem is, the firebox model I was interested in is nowhere to be seen in New England showrooms at the moment. Their trademark application for its name, Multi-Fire XD™, is dated March of this year, and their first brochure featuring it – the PDF above – was prepared in September, so I think the product’s only been on the street for several weeks at most. So problem one was that I couldn’t even get a look at it in person. I liked what I saw in this YouTube video posted by Dimplex, and was impressed not just by the look and features, but because no other electric fireplace manufacturer will show you their flame effect close up and at great length. Only Dimplex does. Remembering the other electric fireplaces I’ve seen, I believe the reason is pretty clear. What I want in the end is a media console much like the one I already have, except with the inbuilt fireplace. However, the model I like weighs 180 pounds with the insert firebox and would cost me a mint to ship back if I didn’t like it. Problem two. And, I could not picture myself buying a fairly big ticket item like this sight unseen. Problem three. I eventually talked to a helpful dealer about forty miles from me. He didn’t have one of the new boxes to show me (and they have to buy what they put in the showroom), but he did help me formulate a workable plan. He said if I found an online retailer with a decent return policy, I could buy the firebox alone – weighing just 40 pounds – and see if I liked it. If I didn’t, I would be out maybe forty or fifty bucks to ship it back, but at least I wouldn’t have wasted hundreds of dollars buying the whole shootin’ match sight unseen. And if I did like it, I could keep it and buy from him just the media console without the firebox insert. He also said I had chosen well for someone who hasn’t been able to see any of this class of products in person. He goes to all the home & hearth shows, and said that Dimplex is the manufacturer with the best looking products, every year and by far. He said they’re a pain to deal with, “but they’re the best, so I deal.” Sounded good to me, so I ordered the insert from an online shop with a fourteen-day return policy and no restocking penalties. It arrived yesterday – bearing serial number 147 – and it’s currently just sitting on top of one of my end tables. Sometime in the next several weeks, I’ll take the next step and order the console it will fit inside from that dealer near me. Dimplex’s promo photo of their Windham Mocha console has a boring golf picture on the television and a shockingly poor representation of their nifty firebox, so I fixed it up a bit with a screenshot from last week’s HIGNFY and a photo I took of my firebox from the correct angle to paste in here. 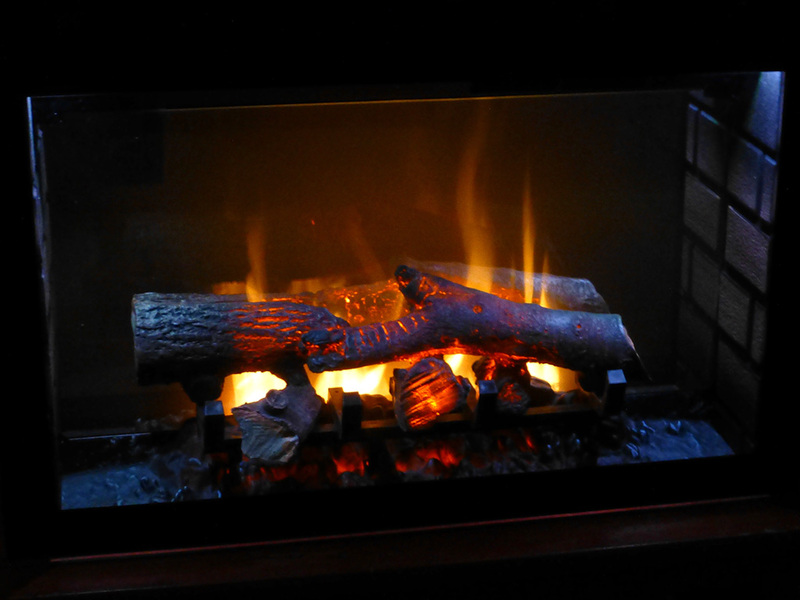 How I added fireplace sound and smell to the firebox is here. The final installation of my media console is shown here. 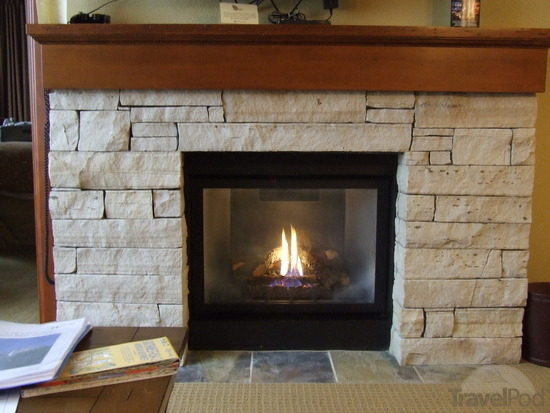 This entry was posted in Gallimaufry and tagged Dimplex electric fireplace, Multi-Fire XD. Oh wow ! Ive had some of the same thoughts….watching a fire must be part of every humans DNA, Lalo. As its something that sets us apart from all other animals. Prehistoric Telly. But I had a look at just how much wood someone would need to get through a normal winter. I have a small garden at my place but even that wouldn’t have been enough space for all that wood ! And the wood where was it going to come from ? Was I going to have to buy an ax ? Nahhhh. The Telly fires are very nice. My parents have one in their condo in New Mexico. They are sandwiched between two couples condos on the ground floor. Both of the neighbors like their place so tropical that my mom only puts on the Telly fire once in a while. When she does, it’s pretty hot ! The one thing you don’t have is that lovely crackling music of a fire. But otherwise the visuals are beautiful. It’s really lovely. Thing is it takes quite a bit of wall space and its there summer and winter alike. Glad to see you all are getting ready for the winter. We ve been having unseasonably warm weather. Last weekend it was 72 F ! I like the fact that the heat can be shut off on the Multi-Fire XD with the flame effect still present – that means I can use it year-round for the pleasing visual effect. Before I got the firebox, I wondered if it might be distracting right underneath the telly when I do get the console, but after gazing at it off to the left of my couch for quite a while in the last couple of days, I don’t think it will, especially if I use the low light setting. It’s so natural looking that it’s the opposite of obtrusive. As to sound, I just found that there are options out there to add fire sounds – ha! I may try the third one, which is fairly inexpensive. That I might find distracting, though…won’t know until I’ve tried it. One very expensive system I looked at – about three times the price of the XD – had inbuilt sound, but when I checked out the video, my brain immediately picked up the fact that the sounds were not random at all, but a never-ending loop of about 15 seconds duration, with one particular louder snap at around the 14-second mark. A regular pattern like that would drive me nuts because I believe I’d be internally, instinctively, maddeningly counting to 15 the whole night long and cursing that fool snap every time it came around. I’ve had thoughts of getting a gel fuel fireplace for some time, but have never done much more than look at catalogs and web sites. I imagine that you also looked at gel fuel fireplaces. What features did you not like about them? I briefly considered them and rejected due to hassle and ongoing expense, mainly. I don’t want to be replacing fuel every few hours – or paying for it, for that matter. The cans are typically a few bucks apiece in bulk quantities and last “up to” three hours. The relatively small amount of heat generated compared to the XD’s heater (1,500-watt max, 750 max in eco mode) is another thing. Because there’s just air space underneath my side of the three-unit building, I’ve always used a small rotating space heater during winter in the living room to get the air at the floor level warmed up. When the air at the forced hot water system’s thermostat level (about four feet high) is 69F/20C, the floor might still be five or six degrees cooler without the space heater, and can be worse than that on really cold days. One of the points of getting the Dimplex was to replace that with something a lot quieter. You can get a media console with a gel fuel fireplace, but the idea of having an actual fire of any kind inside wood furniture would genuinely make me nervous every time I left the room. There’s also the more minor matter of the smell – pretty apparent to me, even from just a few small caterer chafing dish cans burning in the office for a couple hours. I’d have to have a window open, which would prolly remove the small heating benefit they provide. oh hey. I realized that we arent talking about the same thing! My parents “fireplace” is built into the wall. At the same height you might have a flat screen television. It’s a gas flame. On off switch on the wall going into the kitchen. It doesnt look anything like the one at my parents place,(they wouldn’t have been caught dead in a place that looked like that) but the mechanism looks similar. What ever its such a nice looking thing. And you can change the “size” of the fire. More flames, less etc. For your next house Lalo ! Lucky you! Finally you got your dream fireplace! I guess its worth the struggle of searching. 😀 I heard good reviews about Dimplex but after reading your experience, now i am confident about buying their electric fireplace 🙂 Thanks a ton for sharing. Keep up the great work. Dimplex makes good fireplace. Thanks for sharing your good experience. I’m looking for few more reviews on it.